Let us start with a little context : DigiPen Institute is a college that runs game design courses, and who's student project pieces seemingly dominate the Independent Games Festival each year. 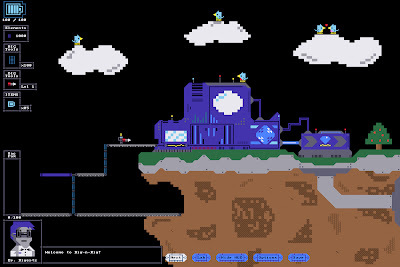 Significantly, 2005 saw the release of student game Narbacular Drop – who's programmers were famously scooped up by Valve and the game concept retooled as Portal. Then in 2009 DigiPen students created Tag: The Power Of Paint – who's programming team then joined Valve and the mechanic of their game integrated into Portal 2. Thus it is always worth keeping an eye on DigiPen’s student work – if only for a glimpse as to what Portal 3 potentially might involve. And so then to Dig-N-Rig. 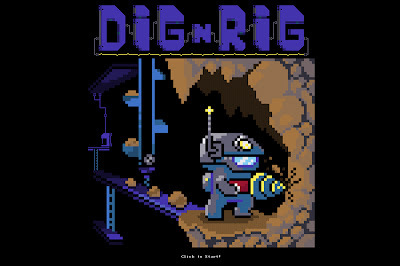 This quietly released game is by Syntactic Sugar Games (a team of four DigiPen students), and is a 2D affair mining game involving the moving your 'Diggit 6400' robot to mine for minerals, and rigging conveyor belts and ladders to get the mined ore back to the surface. More ore means more money to buy more rig and upgrade your digging tools. Soon you’ll be buying bombs to clear areas a little more quickly, and buying a jetpac to help maneuver around. The failings within Dig-N-Rig are easy to spot – it starts with very uninviting tutorial pages with tiny text, and the game is very easy with little reward for completion. The ‘rarest’ ores are not particularly rare (if you look skyward), and thanks to no penalty for removing built platforms/conveyors, there is little need for strategy in rigging anything other than a vertical shaft of belt, with a horizontal conveyor platform that you move as you dig deeper. The abundance of ore makes it easy to upgrade everything, and Dig-N-Rig becomes an exercise in compulsion rather than gaming. But herein lies the juicy centre – oh what compulsion! Like Tetris or Peggle this game tasks you with tidying up, and if your OCD sets in you will lose your life to strip-mining every inch of the play field and will be unable to stop until you are complete. And then you will start all over again. Whilst you perform your Sisyphus-style task, you will encounter some lovely touches - the game has a great ANSI art style about it – and the different areas that you mine have distinct graphical identities and music to enjoy. 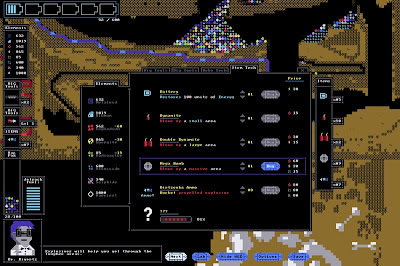 The aesthetic and overall feel of the game is gloriously retro – resembling a weird DOS implementation of Boulder Dash at times. The more robust physics engine and the slightly strange default control method (movement of Diggit is mapped to WASD keys, and the mouse is used to place rigging or use the menus on the HUD) give Dig-N-Rig a very strong sense of identity. 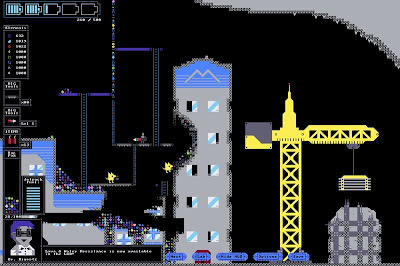 Whilst it is tricky to envisage how the Dig-N-Rig mechanic might be used within the Portal universe, this game has been mentioned in the same hushed tones that Narbacular Drop and Tag: The Power Of Paint were, so don't be too surprised if Chell one day finds herself obsessively mining and constructing conveyors. And hating herself for her addiction. Download the game here (from the DigiPen website). Strangely enough I have the same problem with games involving mining. It took me heroic efforts to drop Minecraft and Terraria and now I stumble upon this. I'll try not to install this game but I know deep inside I will eventually.